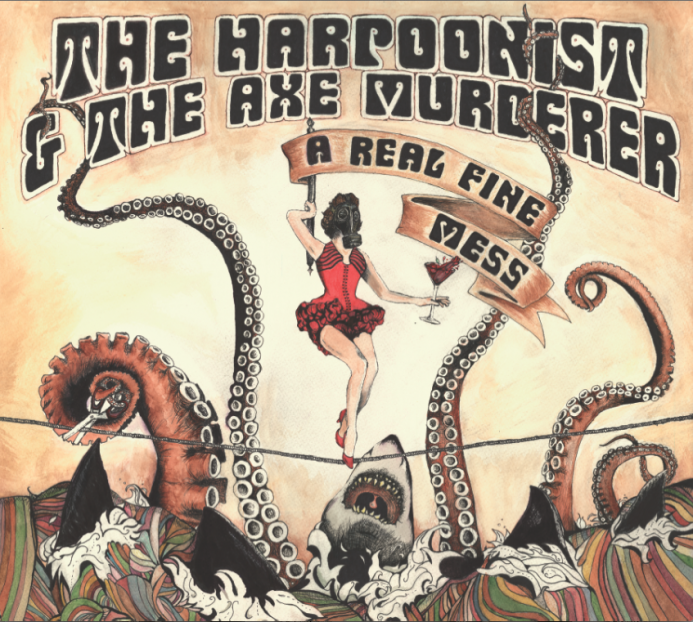 A Real Fine Mess, the new album from The Harpoonist & The Axe Murderer is due for release June 17, 2014. It will be available via the Tonic store. A Real Fine Mess is the third album from The Harpoonist & The Axe Murderer, the follow-up to Checkered Past (2011). The new album explores complicated dichotomies, like how one’s life can appear successful on one hand, yet be clouded by doubt and struggles on the other and how all that is celebrated hangs in the balance with the potential to fall apart at any moment. Recently the band found themselves increasingly inspired not only by the electric ‘groove blues’ of the 50’s, 60’s and 70’s but also by the music of their peers. A wee hours stairwell serenade led to unprecedented vocal collaborations and an awkwardly mismatched festival workshop made the two realize that they needed to ‘up their game’ as songwriters and lyricists. The recording came with its own challenges as Shawn “The Harpoonist” Hall and Matt “The Axe Murderer” Rogers live in different cities separated by 34 nautical miles of sea. 18 ferry trips, 3 missed flights, countless breakdowns, and a barrage of text and email arguments later A Real Fine Mess was born, like the offspring of a can-can dancer and an oil tycoon. The players: Shawn Hall (vocals, harmonica), Matt Rogers (electric guitar, foot percussion), Tom Heuckendorff (organ), Andrina Turenne (vocals), Alexa Dirks (vocals), Dawn Pemberton (vocals), Langston Raymond (trumpet), Chris Startup (tenor sax), Brock Miller (tenor sax), Chad Makela (baritone sax). The band will be touring this summer in support of A Real Fine Mess. See where they’re playing closest to you here. Album art by Ben Rogers.